The effects of a stroke can severely impact the person who has experienced the stroke and their loved ones. The recovery period can be long and many obstacles may arise along the way. Understanding the following three tips for an effective stroke recovery gives you the tools and resources you need to care for your loved one. In order to ensure an effective stroke recovery, family members and caregivers must have an understanding of strokes and their impacts. A stroke occurs when the brain is unable to get the oxygen it needs to function. This typically occurs when blood flow is obstructed. It can lead to long-term damage that requires a significant level of rehabilitation and care. Also, secondary symptoms can arise when recovering from a stroke. These include feelings of depression and cognitive issues such as memory loss and difficulties with speech. 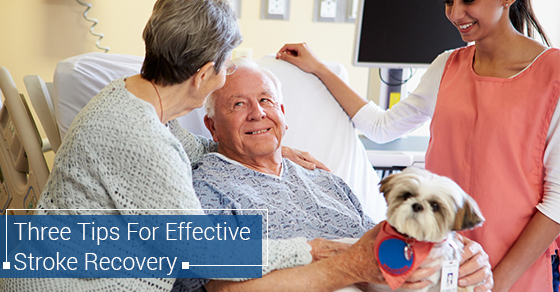 The stroke recovery period consists of a wide range of needs that must be met. Although home caregivers may be able to meet these needs, the use of other facilities and health practitioners ensures a full recovery. Utilizing the right support team provides the right services to your loved one and makes the process easier for family members who must provide care. The right support team also provides these and other services to improve the outcome of the recovery. Healthcare practitioners who take part in this process include doctors, physiotherapists, and speech and occupational therapists. Knowing what needs must be met is essential to the recovery process. Many family caregivers haven’t received the education and resources to fully understand what is needed when recovering from a stroke. An individual may need to be bathed, dressed, and fed. Their daily habits may require some level of supervision and guidance. Any appointments with rehabilitation therapists or doctors must be organized and completed over time. Exercise is important to those who are recovering from a stroke. Rehabilitation specialists typically prescribe exercise programs to use during the recovery period. Putting this program into practice helps people regain their mobility and function. You should take the time to assess all of the needs of your loved one. By identifying the most important factors that must be in place, you’ll provide the best care possible for an effective stroke recovery. Consider the person’s personal, medical, financial, and emotional needs. Understanding that effective care consists of a wide range of aspects of a person’s life is the foundation of a successful stroke recovery.